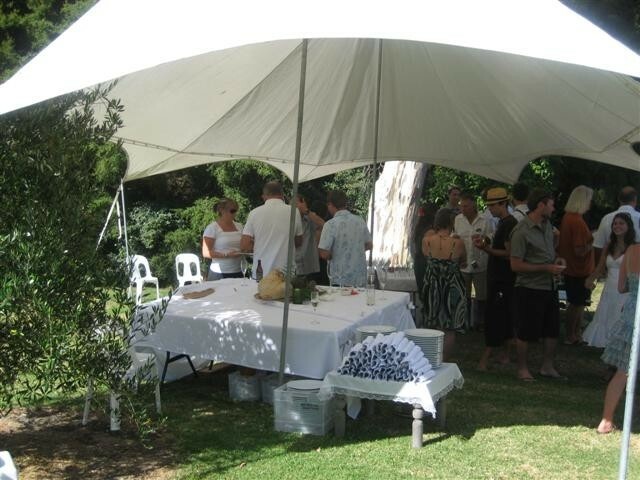 Event tents and Marquees are great for a party, wedding, social event, fundraising, field days, promotional event or any other occasion that requires some shelter. We can manufacture these in your team/company colours. All event tents can be transported in most medium sized cars, marquees will need something bigger! As event tents are made using very high quality UV treated materials they will not blow away in the first gust of wind! Walls are an added extra which keep out the wind and rain, but as they are opaque they do not block light transmission. Walls can simply be attached to the tent and pegged into the ground to hold them in place. We hire an 8m x 5m (light grey) Event Tent and a 7m x 5m Shade Tent. Contact us for booking and price details. If you have a fundraising event, we like to make a contribution to the community, and may be able to sponsor you with a tent for free (subject to availability). We sponsor Whangarei Heads School annual Funky Fishing Competition and the Waipu Primary School Easter Carnival plus many other community events. Contact us to book your tent or to find out more about hiring these items. A 7m x 5m tent which is ideal for schools, sports groups etc. ….Children and Families of Waipu Primary School we would like to extend our heart-felt thank you for the use of your Tents and Marquees.